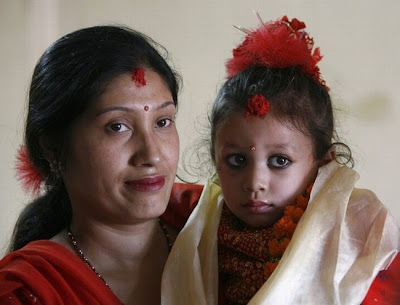 Wrapped in red silk and adorned with red flowers in her hair, Matani Shakya received approval from the priests and President Ram Baran Yadav in a centuries-old tradition with deep ties to Nepal's monarchy, which was abolished in May. 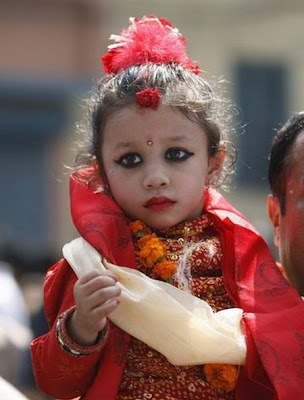 The new "kumari" or living goddess, was carried from her parents' home to an ancient palatial temple in the heart of the Nepali capital, Katmandu, where she will live until she reaches puberty and loses her divine status. The judges read the candidates' horoscopes and check each one for physical imperfections. The living goddess must have perfect hair, eyes, teeth and skin with no scars, and should not be afraid of the dark. 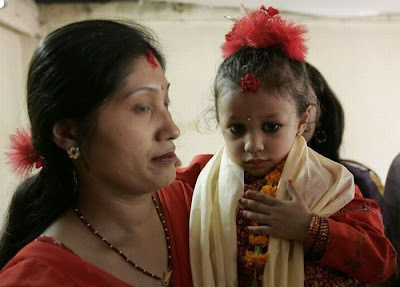 "I feel a bit sad, but since my child has become a living goddess I feel proud," said her father Pratap Man Shakya. During her time as a goddess, she will always wear red, pin up her hair in topknots, and have a "third eye" painted on her forehead. 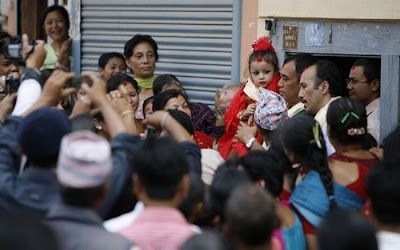 Devotees touch the girls' feet with their foreheads, the highest sign of respect among Hindus in Nepal. During religious festivals the goddesses are wheeled around on a chariot pulled by devotees. Great blogpost as for me. Thanks a lot for enlightning that information. By the way, why don't you find another logo? Well, at least to something like this portable cell phone jammer website has. Wonderful post, sweetie! Keep it up! Almost forgot, I suggest you should make your website a little more social.